Combine the diced meat with the garlic and ginger in a large bowl and set aside. Heat one tablespoon of oil in a saucepan over medium heat and brown the meat there little by little so that it doesn’t sweat. It should come out golden brown. Add the onion, garlic, and chopped tomatoes, stir quickly. Add the soy sauce, vinegar and hoisin. Stir well and correct the seasoning. Turn off the heat and let cool at room temperature. Put one teaspoon of the lomo saltado on each of the wonton sheets, moisten the edges with egg white and roll in the form of a tube, seal the edges well. Repeat this step with all of the sheets and meat. Heat the rest of the oil in a saucepan over medium heat and fry the tequeños until golden-brown, flip once. Transfer to a dish with a paper towel to absorb the excess oil. To prepare the sauce use a blender. Add the mayonnaise, avocado, lemon juice, salt and pepper to the blender and mix. Transfer to a small bowl. Serve the tequeños with this sauce. You can make the avocado sauce spicy by adding ají. You can serve the tequeños with yellow ají sauce. Soon enough, we’ll be ready to enjoy the ultimate football showdown. The drinks and snacks have to be ready in order to enjoy the game and celebrate with loved ones. In Peru, one of the most popular snacks are tequeños; delicate wonton dough rolls stuffed with cheese and served with a sauce similar to guacamole, but can be stuffed with nearly anything found in Peruvian cuisine. This time I used lomo saltado, but they can also be filled with ají de gallina, saltado de camarones, tacu tacu, caramelized apples, vegetables, etc. Originally, tequeños come from Venezuela, but we have given them our own Peruvian touch, making them different from the Venezuelan version. Since these are normally fried, I recommend making them ahead of time and keeping them in the oven at low heat so that when you’re ready to eat them they’re still nice and hot, but not dried out. Tequeños don’t reheat well, so it’s best to prepare them close to when they’ll be served. The filling must be ready and cold. The dough can be purchased in the supermarket or any specialty store, and the sauce can be made in minutes. 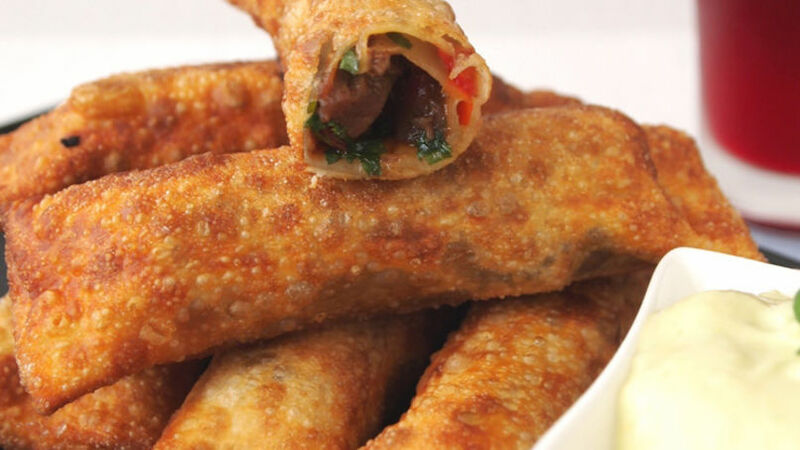 These tequeños are simple snack that are versatile and delicious. What filling will you use?